Donald W. “Don” Schacht, age 77, of North Judson, passed away Friday, February 01, 2019. Don was born February 5, 1941 in North Judson to Frederick Schacht and Henrietta Dunkleburger Schacht, both deceased. 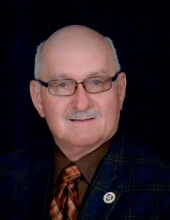 He worked for 30 years at U.S. Steel, he loved horses and was on the Starke County Sheriff’s Posse from the beginning, and he loved driving truck. He loved people, especially his children, grandchildren and great grandchildren and his wife. People always said that he never met a stranger. On August 5, 1961 he married Clara Queer, she survives. Also surviving are his children, Donald Lee Schacht of Tennessee, Pamela Nix (Tim) of San Pierre, Patricia Ann Ream (Kris) of Greenwood, IN, David Wayne Schacht (Dolores) of Florida, and Doug Schacht (Michelle) of Greenwood, IN, 12 grandchildren and 10 great grandchildren, and 3 sisters, Lois Krulik (Frank) of North Judson, Mary Lou Hemmelgran (Bill) of Portland, IN, and Betty Bobcek (Kevin) of North Judson. He was preceded in death by a son, Michael Ray Schacht, brothers, Bill and Harold Schacht, and a sister, Donna Hounshell. Visitation will take place Tuesday, February 5, 2019 from 3-7pm (CT) at M.C. Smith Funeral Home. Funeral services will take place Wednesday, February 6, 2019 at 11am (CT), with visitation one hour prior to services, at St. Peter Lutheran Church in North Judson. Burial will follow at the Highland Cemetery in North Judson. Please make memorial contributions to Riley's Hospital for Children or St. Peter Lutheran Church in North Judson. To send flowers or a remembrance gift to the family of Donald W. "Don" Schacht, please visit our Tribute Store. "Email Address" would like to share the life celebration of Donald W. "Don" Schacht. Click on the "link" to go to share a favorite memory or leave a condolence message for the family.